The Investigators: Was Ahmad Khan Rahami really acting alone? LINDEN, New Jersey (WABC) -- New York City Mayor Bill de Blasio and other officials insist they're not looking for anyone else in particular in regard to the terror incidents in Seaside Park, Chelsea and Elizabeth. But could that have been a smokescreen to convince possible accomplices they're in the clear? The Eyewitness News Investigators took a closer look. This was a lot of work for one person to prepare all these bombs, so is it possible no one else knew about them? Ahmad Rahami was allegedly able to do what 20 other terrorist plotters since 9/11 failed to do: Make bombs, plant them, and even detonate some without being detected. Was it pure luck, or did he have help? That's the key question as the investigation moves forward. Just 28 years old, the Afghan immigrant who worked at his father's chicken restaurant eluded police and the FBI as he allegedly built pipe and pressure cooker bombs, planted them across two states, and detonated one in the heart of Manhattan. And he apparently did so without any help. "I have no indication that there is a cell operating in the area or in the city," FBI Assistant Director William Sweeney, Jr., said. "The investigation is ongoing, so as we develop more information, we continue to go. But I have no indication there is a cell operating here." 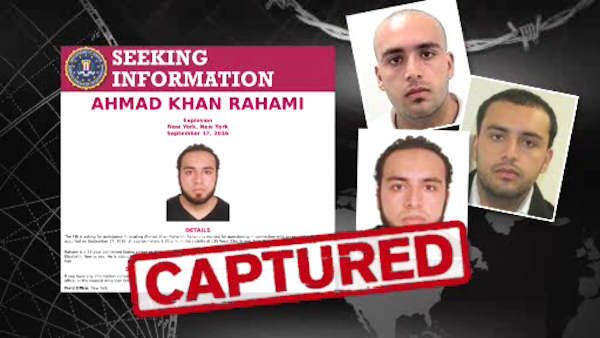 Authorities say they're not looking for any additional suspects at this time, but the number of bombs made and the different types, with different explosives, suggests Ahmad Rahami may not have acted alone. "He either set up pressure cooker devices before and knew it would work, or he had assistance from someone else," said Clint Watts, formerly of the FBI Joint Terrorism Task Force. "He could have pulled it off on his own and just been a very talented bomb-maker, but that sophistication isn't normal." While Rahami was not on any watch list, he did have a criminal record. He was charged in 2014 for allegedly assaulting someone and for illegal possession of a weapon, and two years earlier, he was arrested for allegedly violating a domestic restraining order. Although these recent arrests hint at a violent side, when he had the chance to cause widespread harm with bombs, he planted them away from big crowds. "Placed them in ineffective places in the city," Watts said. "In dumpsters, on top of dumpsters, which points to, did he really want to kill people or scare them? Why did he hold back?" But what changed him from the young man studying criminal justice and living above his family restaurant to someone who authorities say built bombs undetected, until it was too late? "Why didn't we find a tip or indicator from locals or family members or in the area?" Watts asked. "That's what everyone will look for, what were the preliminary indicators?"